Chicken soup is often a staple when you’re fighting a cold or flu but did you know that homemade chicken soup actually has health benefits too? Cuddling up with a bowl of hot chicken soup is the best cure for colds in the winter months, according to researchers. A study found that chicken soup could ease the symptoms of upper respiratory infections because it contains anti-inflammatory agents. Further research shows that the aroma, spices and heat from the soup can clear congestion brought on by the common cold. A researcher from the University of Nebraska put his ‘grandma’s soup’ recipe to the test to find out if the myth is true. Whether this is actually true or not I personally find it so comforting when I feel a cold or virus coming on. With fresh ginger and homemade chicken stock it’s hard to beat, it’s certainly a staple in my house throughout winter. 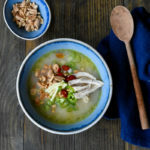 This soup can easily be made from the leftovers of a roast chicken, just strip the carcass of any meat then simmer the bones with vegetable trimmings and you’re half way there! If you’re making the soup from scratch I always recommend using chicken thighs, firstly they are tastier than the breast, they don’t dry out and they’re cheaper. Combine the honey and 50ml of freshly boiled water in a small bowl, stirring to dissolve the honey. Add the ginger and leave in the solution until cool; drain and set aside. Bring chicken, stock, shallots or onion, lemon grass and garlic to a boil in a large saucepan. Reduce heat and simmer until the chicken is cooked through, 15-20 minutes. Transfer the chicken and garlic to a cutting board and let it cool; discard shallots or onion and lemon grass. Squash the garlic to a paste using the side of a large knife; return to the saucepan and stir to combine. Shred the chicken; set aside. Bring the soup to the boil and add the rice. Reduce heat and simmer, stirring occasionally, until the rice is tender and the grains have burst (it should thickened a little from the starch in the rice) This will take approximately 30-35 minutes. Stir in the lime juice, fish sauce, and the reserved shredded chicken; taste and adjust seasonings with more fish sauce and lime juice if necessary. 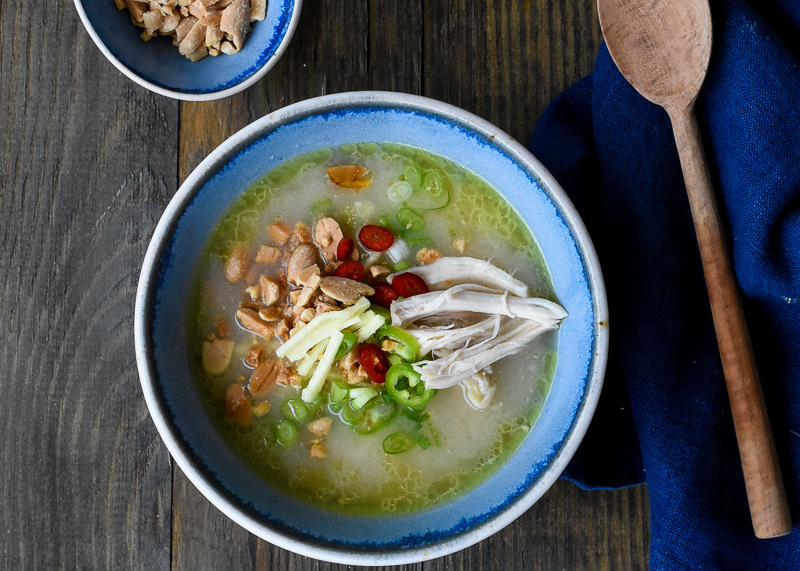 Divide the soup into bowls; top with reserved ginger, chillis, spring onions and peanuts.